Welcome to our final Friday’s Frock for 2015! It’s been a great month of raising awareness and funds for the Ovarian Cancer Research Foundation while I’ve showcased some fab new season frockery from some smaller, boutique labels. 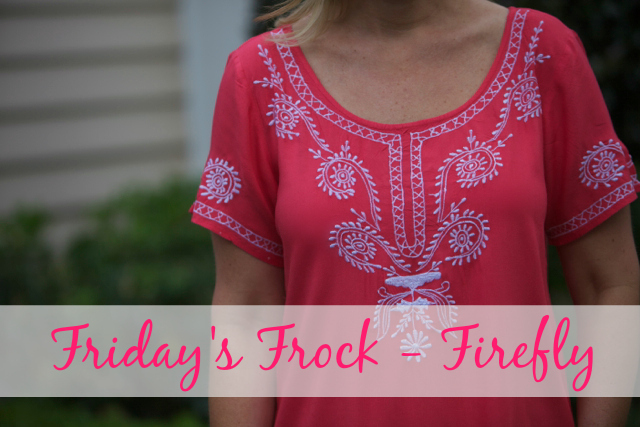 This week – fittingly as I’m in Bali – I’m featuring a pretty summer tunic from Firefly. Have you heard of Firefly? I’m a big fan and love their easy wearing summer frockery. With gorgeous summer dresses made from light-weight floaty cotton, a bohemian flair and intricate contrasting details, Australian brand Firefly is perfect for those of us who want to look great whilst feeling comfortable. Firefly dresses are easy to wear and feature bold prints, which suit the lifestyle demands of women living in warmer climes. Or Victorians who like to go on holidays to more tropical destinations! 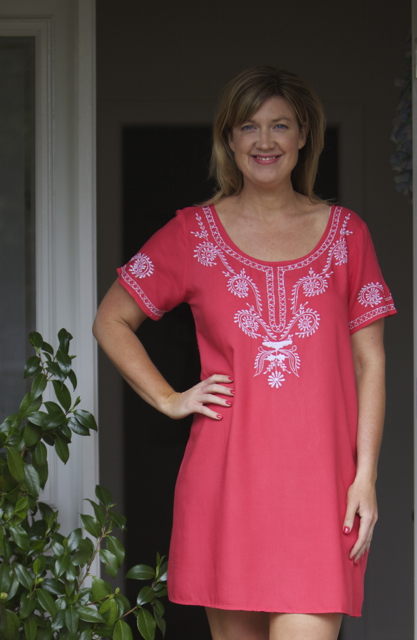 Today, I’m wearing the Nicole Embroidered Tunic* from Firefly which retails at $89.99. Size wise, I’m wearing a Medium and it’s nice and roomy. It’s quite short, finishing a good few inches above my knee, although I’m quite tall. As such, it’s perfect for throwing on over bathers for a trip to the pool or the beach. If you like the style but pink’s not your thing, this tunic is also available in three other colours – blue, grey and light blue. Also, through the month of October (so you still have a few days left), Firefly will be donating 15% of all sales on selected pink items to National Breast Cancer Foundation, so check out their great range here. Also stay tuned for the launch of their new range, Phoebe and Rose, on 12th November. 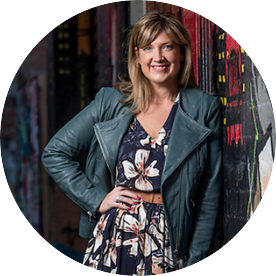 If you’d like to support me in my Frocktober-ing or find out more, just head here and a big thank you to those who’ve donated so far. Are you a fan of Firefly? Did you get your Frocktober on this year?